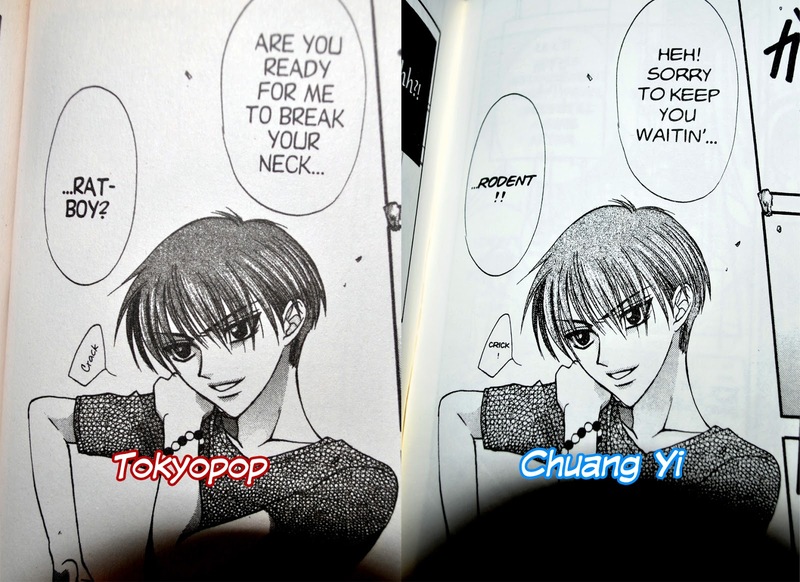 A Brit's journey through the translation and retranslation of manga into the English speaking world. 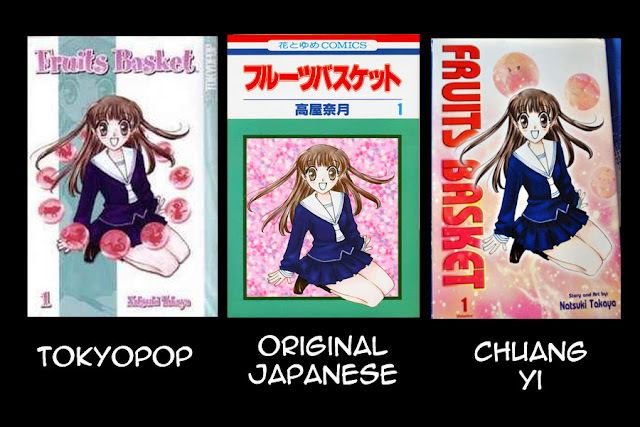 You can't delve very deeply into the world of shoujo manga without having heard the title 'Fruits Basket'. The story of the orphan, Tohru Honda, whose optimistic nature is tested who, upon meeting the Souma family, is thrust headfirst into the world of the supernatural. After getting to know them and learning of the tragic curse that has befallen them for generations; she resolves to break the curse and end their suffering. Cuddly animals, goofy hijinks and romantic subplots ensue. I first read fruits basket through my local library and gradually fell in love with the complex character relationships that drove the plot forward. Being considered one of the most famous shoujo, it seemed an appropriate place to begin with Chuang Yi releases. To bring anybody who’s unaware up to speed, Chuang Yi is a company based in Singapore, who specialises in translating Japanese manga into English and simplified Chinese. 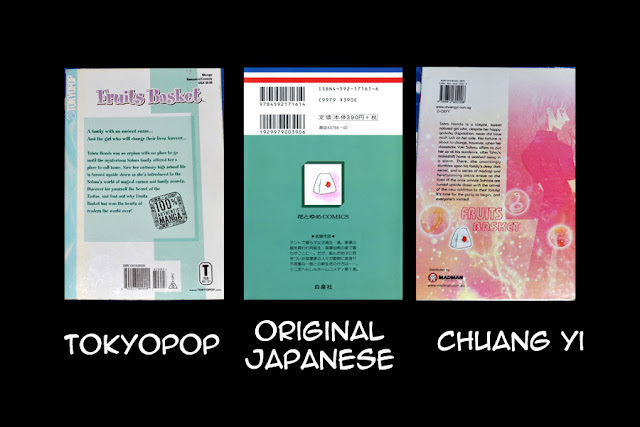 This blog entry is an observation and comparison of some of the differences that were encountered upon reading both the Singapore (Chuang Yi) and American (Tokyopop) releases. Important Note: Because I don't own a copy of the Japanese volume nor have any knowledge of the language, aside from the covers, I will not be comparing the English releases to the original Japanese. In my opinion, both English releases appear to be equal distance from the look of the Japanese and have each gone their own way with their respective covers. You could argue that Chuang Yi took the red lettering whilst Tokyopop chose to copy the turquoise colour scheme, but that might be stretching it. Interestingly, both English versions have added orbs/bubbles containing animals of the zodiac. 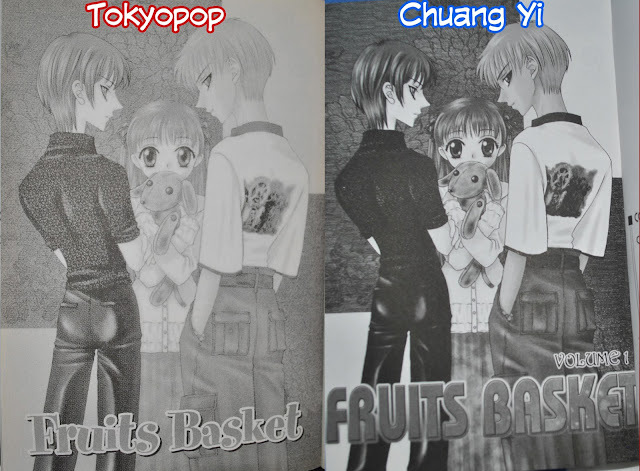 All three covers have the same image of our main character, Tohru, on the front, but there is a noticeable difference in the detail on Tohru's hair and clothes. Details such as the lineart, shadows and highlights are more pronounced and the picture can be seen in greater detail as a result of Chuang Yi's release. 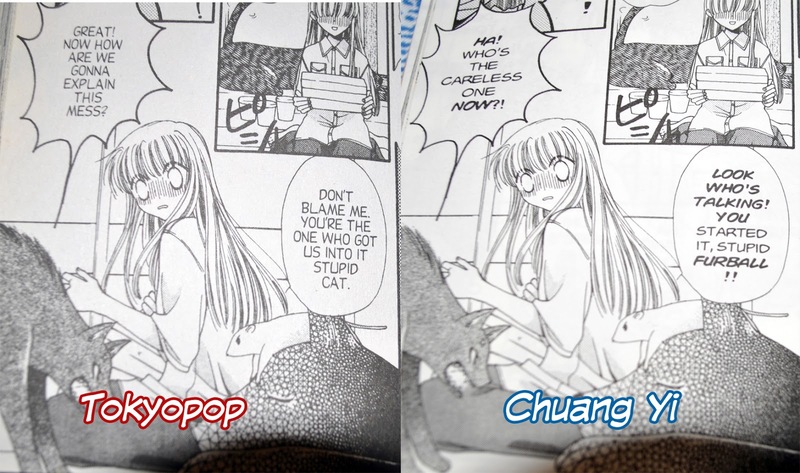 The Japanese version appears to be more faded and Tokyopop's release seems to have recoloured Tohru's clothes to be more purple. The back cover largely keeps the simple design from each cover respective front while adding details like the riceball. Chuang Yi's release keeps this riceball and continues the bubble theme with the zodiac animals along with an image of Yuki, Tohru and Kyo, which is only fully visible when the dust jacket is unfolded. The same image is on the cover of chapter 1 in black & white See 'Artwork'). 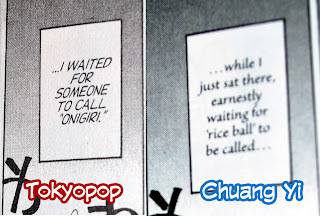 Tokyopop transferred the riceball to the inside of the cover. A cool little extra that will get damaged easily if I'm not careful. Yikes!! Here we can see that Chuang Yi's release has kept it's slip cover like the original Japanese, while Tokyopop's over is just printed on the book itself like most manga in the West. Neither release has any colour pictures at the start; instead opting for the black and white versions of them. 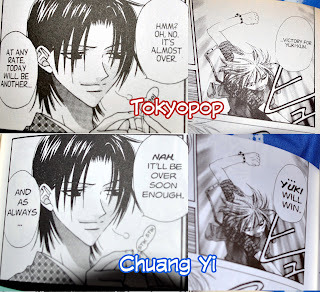 Interestingly while Tokyopop may have printed the artwork too lightly, making it hard to see the lineart as well as details in their hair, Chuang Yi probably printed it a bit too dark so we can't quite see the shadows and screentone on Yuki's clothes (see above). Though so far I haven’t run into anything that prevents the finer details from being seen, in the story, certain pages appear more grainy in Tokyopop's version, but this may be because of the type of paper. 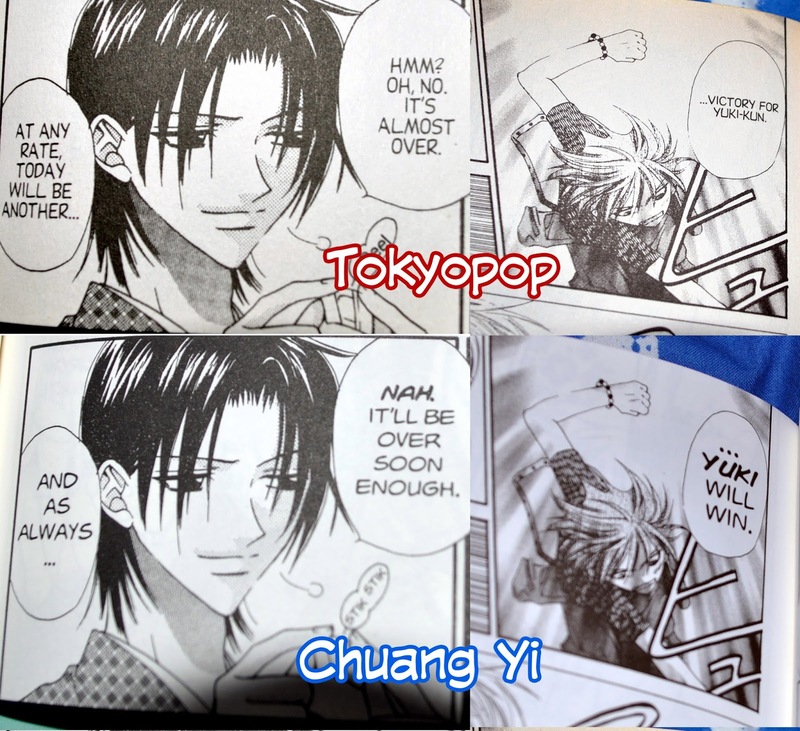 Speaking of paper, another interesting point is how Tokyopop's release has MUCH more yellowing on the pages whilst Chuang Yi's release appears crisp white. This affects how clearly the artwork stands out on the page allowing the artwork to 'pop'. Lastly, according to the book's printing dates, they were only printed a year and a half apart from each other (see table below). I ended up buying both these books at a secondhand bookfair and thus can't speak for their full history, so the Tokyopop book could have been left in the Sun more and thus that's why it appears yellower. I've noticed that Chuang Yi Publishing will often license a particular title after it has been licensed in the States. 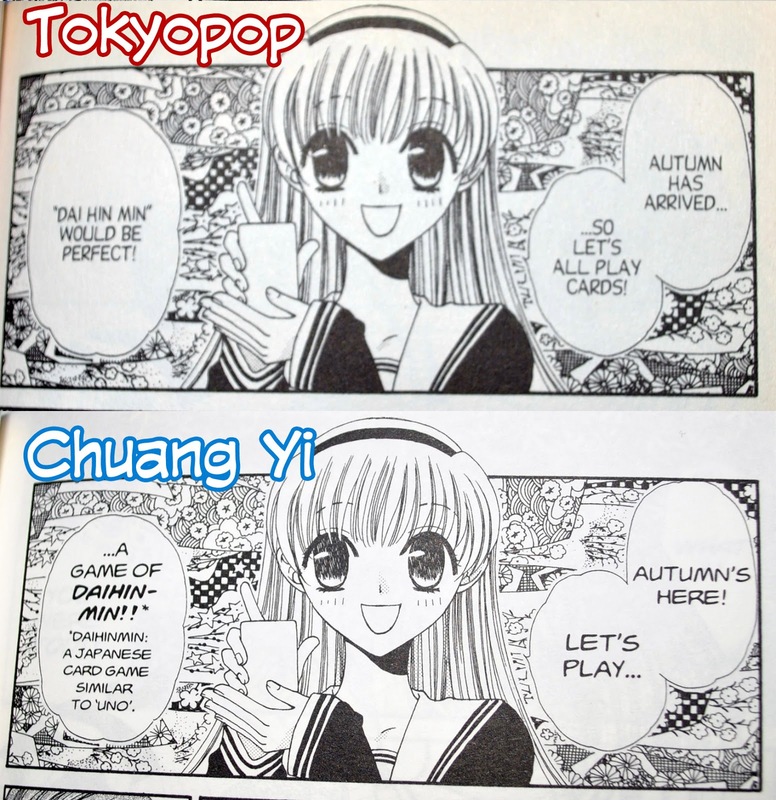 It could be that companies like Tokyopop and Viz only have the license to distribute in the Western English speaking countries, while Chuang Yi has the rights to distribute for English speaking Eastern part of the world. 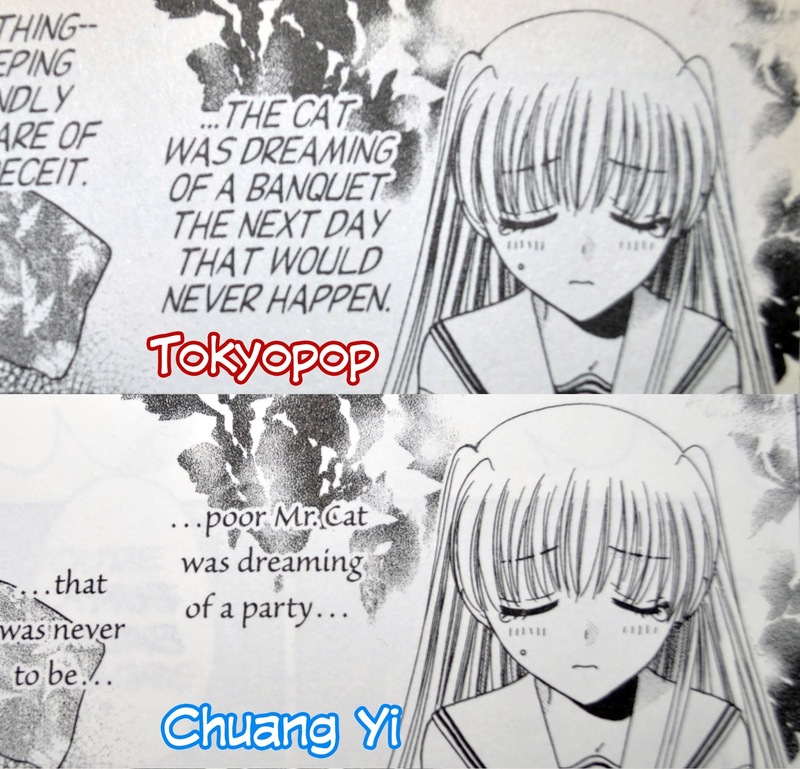 Another possible theory is that Tokyopop is sub-licensing the manga to Chuang Yi. I'm probably completely wrong about this, but I'm baffled how there could be two official English translations in the first place. On this occasion interestingly both releases seem to have translated the sound effects very sparingly. This disappointed me when I picked them up as I was hoping to finally learn what they all were. Tokyopop did this with quite a few of their titles sadly. Well, back to my Japanese dictionary then. While there doesn’t seem to be much difference between the releases initially, one important difference is the lack of Japanese honorifics in the Chuang Yi release. 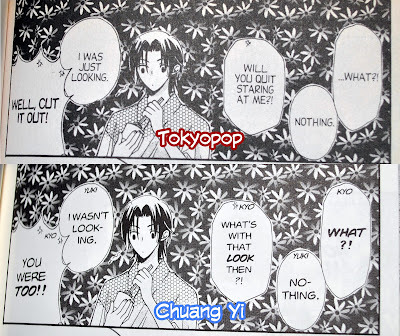 Despite this, Tohru and Yuki still refer to each other by last name. I realise a lot of people refer to each other by their last name, particularly in the States, but I would've preferred if they localised the san honorific and made it 'Mrs Honda' like the anime. 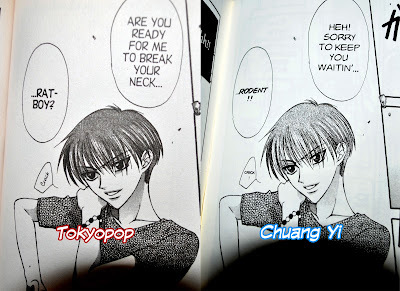 This little change, in turn, creates a difference in translation as, without the honorifics, Chuang Yi had to rewrite what Yuki says to Tohru's family near the end of the book. However, the meaning behind it is pretty much the same so there's no real issue here. 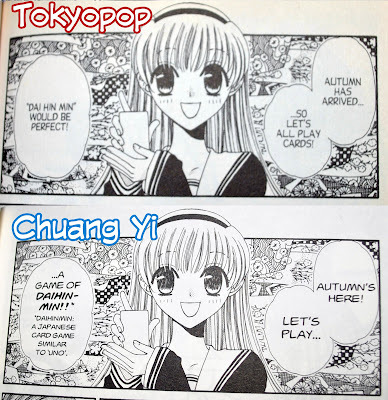 Tokyopop usually localise Japanese terms to make them more understandable to an English reader in most of their titles. 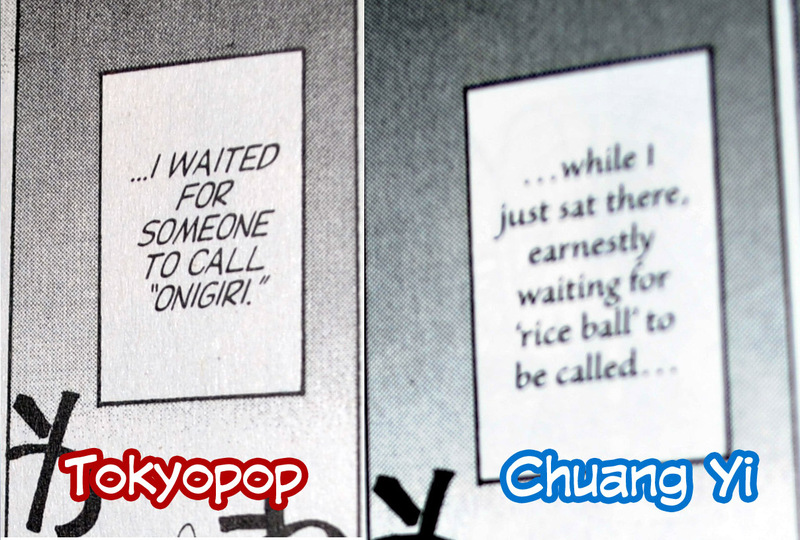 Here, however, they’ve chosen to leave in the word “onigiri” while Chuang Yi localises it to “rice ball” like in the anime. The characters all basically retain their personalities in both releases, but there is definitely more swearing in the Chuang Yi release possibly due to a lack of censorship on their part. That's right. In her inner monologue, Tohru refers to the mysterious 13th animal of the zodiac, or rather not, as 'Mr Cat' rather than 'the Cat'. There's clearly no honorific there so it must be a creative liberty. Hmm...curious. 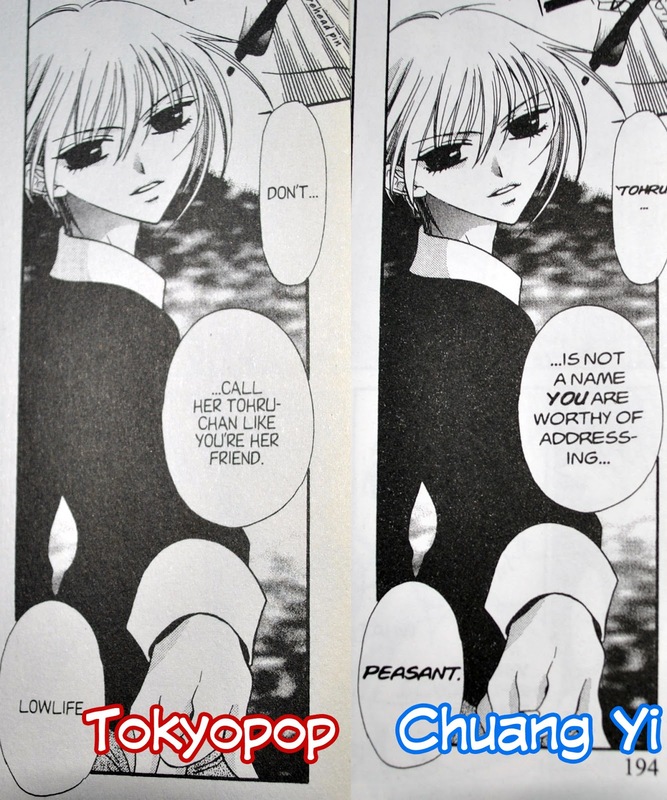 Shigure will also occasionally use borrowed French words in the Chuang Yi's release, lol. Another small difference is what Yuki and Kyo tend to call each other when arguing. Just a quick story observation that I noticed when reading this for the first time years ago. It was obvious to me, right from his introduction, that Kyo was going to be the key love interest in the story. That observation came from the fact that he was better drawn then Yuki and looked like his design had been practised more. Not to mention he was a bad boy. Hana, for me, has always been one of the biggest enigmas of Fruits Basket. In volume 1, she is simply established as a quirky character who’s a good friend to Tohru, but who isn’t really understood by anyone, including her friends. She seems to see the world differently from the other characters and notices things the other characters don’t. She doesn’t speak much, but when she does it has an impact. After all, what has more impact than a death ray?! 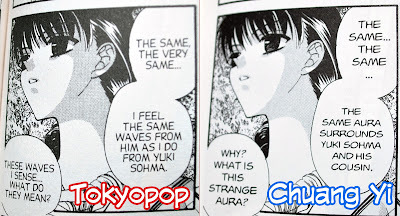 Also while she constantly talks about the other characters 'waves' in Tokyopop's release, it's translated as 'auras' in Chuang Yi's. Round of applause for shooting straight from the hip in both versions. I'll move on to a few things I thought each version did better. These are only small nitpicks and will not stop you from enjoying either version. 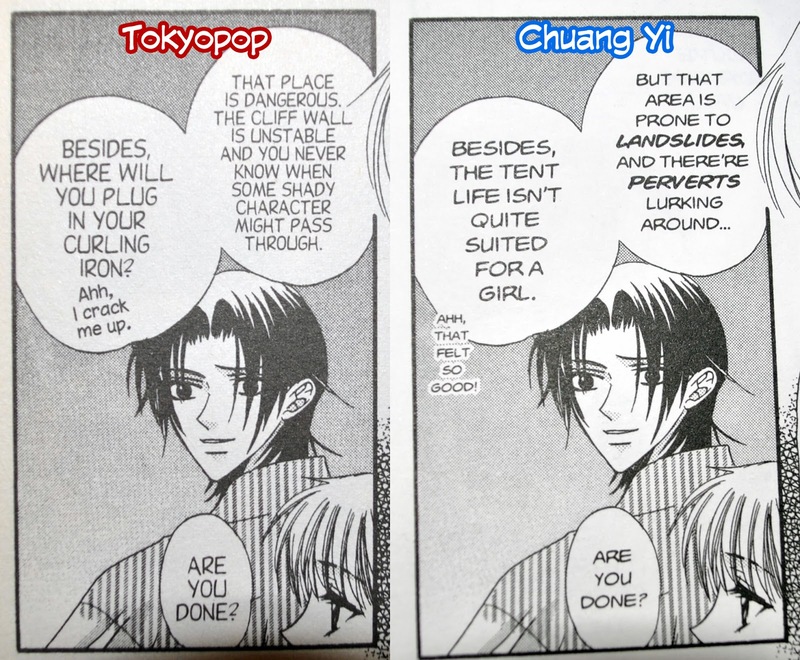 An advantage Tokyopop had was the way in which they translated some of the jokes, which can sometimes fall flat in Chuang Yi's release. What felt so good, Shigure?! 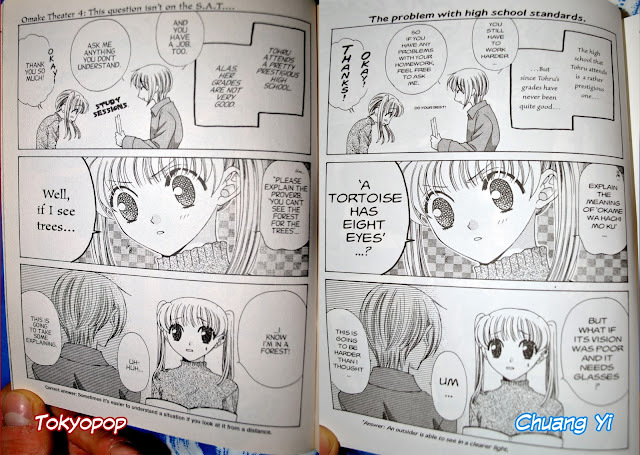 This is one example where Tokyopop were able to nail down the point of the joke better here (pictured above). Tokyopop also gives the proper name of the special rule, Counter Revolution, when the characters are playing a game of Daihinmin (pictured above). Moving on to some of Chuang Yi's nice little touches. When a character, who is off-panel, speaks Chuang Yi's translator helpfully puts the name of that character in their respective speech bubble so the reader wouldn't get confused. What a thoughtful person! Not you could fail to tell who was arguing in this example. 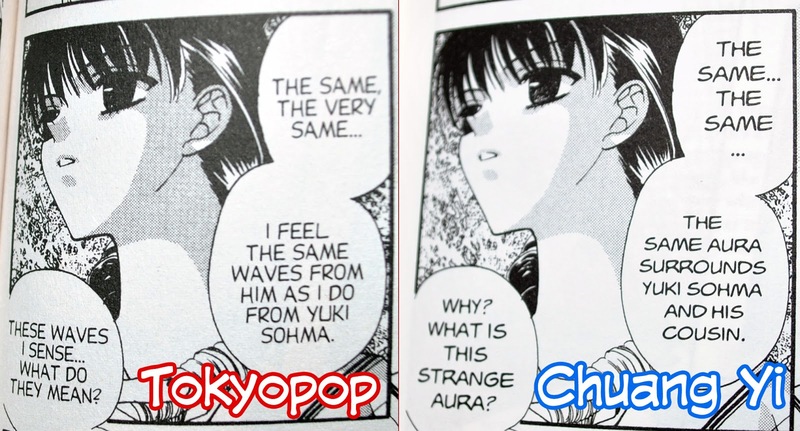 Edit: It's been pointed out to me that the Tokyopop release includes little symbols in the speech bubbles, to help the reader, rather then the actual names. This symbol could be the first letter of their name, like a Y for Yuki, or an anger mark in the case of Kyo. I will say that Chuang Yi's discision stood out more and thus I think my point still stands. Sorry about the flop. Also, based entirely on my own enjoyment, I felt the dialogue in this page made more sense to me in the Chuang Yi release (pictured above). Her friends must be wondering why she decided to randomly quote a dictionary to tell them about the game. Maybe that should have been a footnote. Still helpful to the English reader though. I didn’t find much in the way of mistakes in the Tokyopop edition, though more observant readers may tell me otherwise in the future. In the Chuang Yi release; however, there were a few occasions where a sentence didn’t make sense because a single word was in the wrong tense. However, this was very infrequent. Since Chuang Yi has a reputation for doing a cover to cover translation of the Japanese tankaban, there is obviously no interview with the anime English VA in the back. However, all the bonus comics are there with a translation that looks like it might be closer to the original Japanese due to the inclusion of the romaji in the middle panel. That’s just my guess. However, I can't seem to find this phrase online so I don't know if it's present in the original Japanese or if Chuang Yi made it up. It doesn't seem likely. Also, I'm a little curious as to why we had a sudden font change in Tokyopop's middle panel though. When it all comes down to it, I would say that readers can’t go wrong with either of them and it comes down to personal preference of wording or honorific’s. The Chuang Yi release is still in print as far as I know, but it’s distribution is restricted to the East as well as Australia and New Zealand. For this reason, many people have never heard of Chuang Yi Publishing. All in all, it's a solid start to the 'Fruits Basket' series for the both of them and I can't wait to read more. That's all for now. Apologies for all spelling mistakes and grammer flops. Thankings for reading and free digital hugs to you all! The other thing is the exam question in the bonus frames. It is asking "What is the meaning of the expression 岡目八目". Chuang Yi added an extra "wa" to the romaji of this yojijukugo, which is supposed to be just "okamehachimoku". And it means "An onlooker may perceive the situation better than those involved in it". 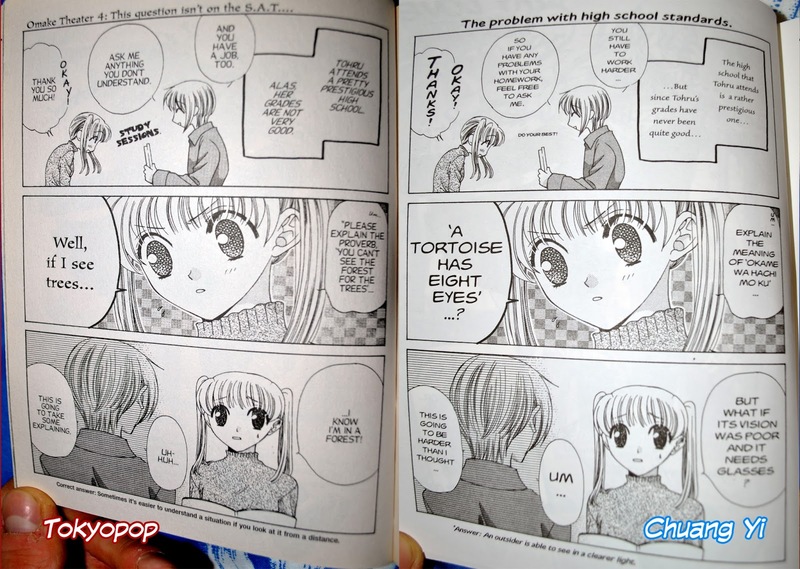 Tohru completely ignores the kanji, and treats the "Okame" as if it was "a tortoise" (お亀), "a tortoise has eight eyes" (she does notice the two last kanji...), and then goes off at a tangent with the question about what the poor tortoise will do if it loses its eyesight and needs spectacles. Yuki's answer is ambiguous: "This is a tough problem". 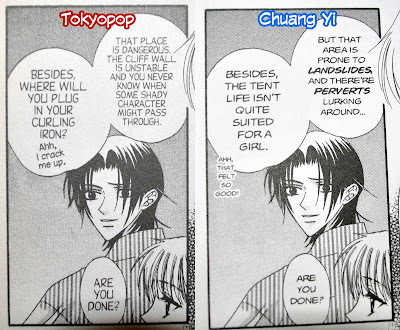 So Chuang Yi were more literal but TokyoPop actually got the closest English idiom - though they missed the going-off-at-a-tangent part. Thanks for the insight. I don't care if it's an old post, I'm always happy to recieve a new comment. Some day I hope to add more comparisons to this blog, but first I have to find the other volumes and stop being lazy. Thanks. Hoping to do an updated version someday that includes the new Yen Press release. I'm a Brit currently living in Australia with a degree in Animal Behaviour. Currently I'm trying to improve my drawing skills to one day write and draw my own graphic novel. Any pictures featured on this blog belong to their respective owners. If you see your picture featured and don't want it to be, email me with link and I will take it down right away.